What are the precautions on purchasing a concrete pump truck for sale? As an equipment of modern construction method, the concrete pump truck has the features of large conveying capacity and fast conveying speed, which plays an irreplaceable role in accelerating the construction progress, shortening the construction period and reducing the construction cost. In the pursuit of construction efficiency today, concrete pump truck has been more and more accepted by the construction market. Then what should we pay attention to while choosing concrete pump truck for sale? 1. Buy well-known concrete pump brands, product quality can be ensured. It is required to check the appraisal certificate, type test report, test report of the special vehicle strong seizure item and motor vehicle catalog number, quality system certification, etc. It is better to examine the enterprise production, management and quality as the basis for select machine. 2. According to the situation of the undertaking project and the size of the construction project, the length of the construction cycle and the frequency of the transfer, the maximum pumping capacity, the parameters of the boom and the corresponding chassis to determine the choice. The product quality inspection should be taken from the outside to inside, the first is the appearance, painting, welding steel structure, the stage, railings, etc. And then gradually into the internal, chassis, engine, transmission, split bridge, the main hydraulic components, pumping systems, fabric boom, slewing ring and other supporting components performance quality. 3. Investigate the performance of the concrete pump truck for sale, check the stability and flexibility of each part action, ensure there is no abnormal when stretching and the recovery the pump boom, check whether the chassis travel, turning diameter, approach angle, departure angle, minimum ground clearance met requirements, whether the engine fuel consumption and other economic indicators is reasonable, whether the remote control operation is reliable and stable. RE: What are the precautions on purchasing a concrete pump truck for sale? The concrete pump truck is a main equipment of construction machinery during commercial concrete transportation and deposition. 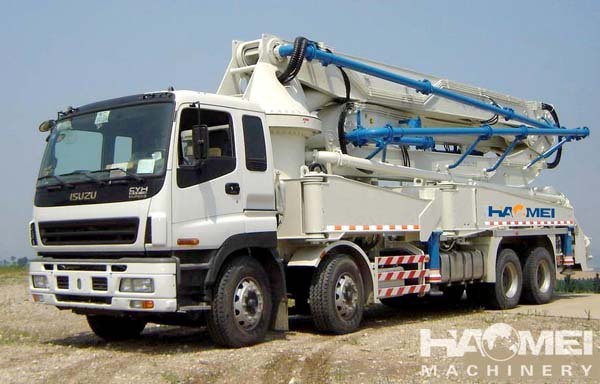 Then what should we pay attention to while choosing concrete pump truck for sale? the preheat for concrete pump truck is mainly for pumping hydraulic systems, this is because, at low temperatures, the viscosity of the hydraulic oil increases and the fluidity decreases, resulting in the flow resistance in the pipe increased. In the state of high viscosity of the hydraulic oil, the hydraulic pump has oil absorption difficulties in the working state of the overloading, and even occurs “pumping air” phenomenon, and the hydraulic pump may be excessively worn due to poor lubrication. Therefore, before the formal construction of the concrete pump trucks for sale, it must be sufficient preheating. Especially in the winter construction phase, due to the original lower temperature of the hydraulic system, the upper garment preheating is even more important. Most of the concrete pump truck manufacturers introduce concrete pump truck preheating method as turn on the power take-off in the case of the engine started. When the hydraulic pump passive operation for a period of time, the hydraulic oil temperature rose to the required value, the hydraulic oil viscosity will reach the normal working condition, the preheating is completed. This recognized preheating mode may seems to be simple, but in fact it is not. In the case of the preheating of concrete pump trucks for sale is carried out in the right state, it can effectively reduce the bodywork hydraulic system wear and failure rate. On the contrary, improper preheating will inevitably aggravate the wear and tear of equipment. So the preheating operation need professional guideline and operator, if you still have questions about how to preheat the pumping, please review our website to get more information.